(9 23959-1 B) released 1983 by Warner Bros. Records USA. Track 01, 02 and 04 produced by Allan Holdsworth. Track 01, 02 and 04 mixed by Robert Feist. Track 03, 05 and 06 mixed by Mark Linett. Recorded and Mixed at Music Grinder Studios. Engineers : Gary Skardina, Jeff Silver, Jeremy Smith, Robert Feist. Mastered by John Matousekat at Motown Record Corporation. 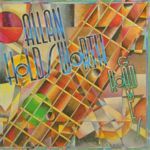 un-credited guitars on Allan Holdsworth "Road Games" EP. Years later it's confirmed that Mark St. John was in the studio, playing with Allan Holdsworth.